Are you planning a beach wedding, or would you be going on a honeymoon where there is a beach, blue sky, sun and some romance? 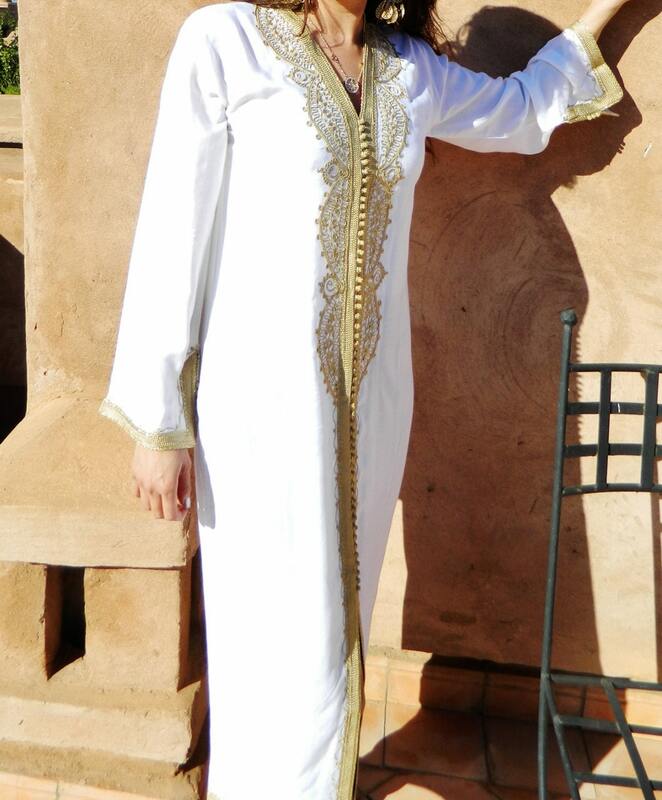 If you are, this caftan is a perfect outwear for this wedding occasion. Wow your groom, and make your wedding occasion an unforgettable one. Also, you could wear this caftan as a 'pair-look' with your bridesmaids. For the brides, you can choose the white with gold embroidery. Your bridesmaids could wear the same design in another colour. Please just contact us for further info. You could purchase this just as a honeymoon/wedding caftan, or you could purchase 7 (6 bridesmaid & bride) and celebrate the 'hen-night' , or an outing with just your girlfriends before the wedding. We are sure, all eyes would be on you and your bridesmaids! If you would be interested in purchasing 7 caftans, the price would be for 6 caftans and one caftan will be free. Just purchase 6 in quantity and leave a note for us 'one free kaftan'. Don't miss this precious opportunity. May you make your wedding a special one and celebrate your special occasion with the loved ones, and great friends. This kaftan is ONE SIZE. (there is an inner belt to tie to any shape and size). °º©©º°¨¨¨°º©©º°¨¨¨°º©©º°¨¨¨°º©©º°¨¨¨°º©©º°¨¨¨°º©©º°¨¨¨°º©©º°¨¨¨°º©©º°¨¨¨°º©©º°¨¨¨°º©©º° °º©©º°¨¨¨°Our products are great for special occassions too: for halloween, Christmas, birthday, Ramadan, Eid and many more.., halloween. Perfect for Black Friday Sale, Christmas gifts, gifts, new year gifts. Great gifts ideas for Valentine's Day, Mother's day, Father's day too!Great as a Easter gift for your family and friends, and the upcoming Mother's day gifts. This is a beautiful item. Nice fabric with beautiful details.